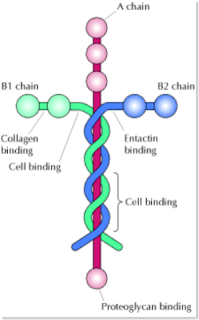 Have you heard about laminin...What is laminin...what the meanings of the laminin? i think all of you here also don know what is that?? Am i rite? According from wikipedia....Laminin is a protein found in the extracellular matrix, the sheets of protein that form the substrate of all internal organs also called the basement membrane. It is the major non-collagenous component of the basal lamina, such as those on which cells of an epithelium sit.It has four arms that can bind to four other molecules. The three shorter arms are particularly good at binding to other laminin molecules, which is what makes it so great at forming sheets. The long arm is capable of binding to cells, which helps anchor the actual organs to the membrane.